How did doctors make a living? Making a Medical Living explores the neglected socio-economic history of medical practice, beginning with the first voluntary hospital in 1720 and ending with national health insurance in 1911. It looks at public appointments in hospitals and dispensaries, office under public welfare systems, and at private practice. In this innovative study, Anne Digby makes use of new sources of information, looks at ordinary rather than elite doctors, and analyses provincial rather than metropolitan practice. From the mid-eighteenth century medicine became more commercialised; doctors travelled to see ordinary patients, developed specialisms, and were entrepreneurial in expanding institutional forms of health care. This entrepreneurial activity helped shape English medicine into a distinctive pattern of general and specialist practice, and of public and private health care.
" 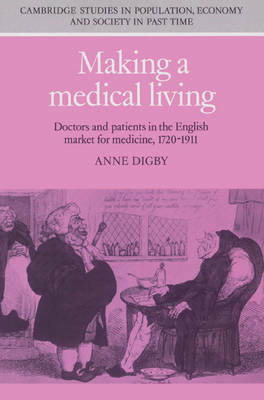 Anne Digby reminds us that while physicians in the past treated patients, invented new medical theories, compounded medicines, and made discoveries about the human body, they also made a living...much of Digby's story is familiar to us - marginal men delivering babies, taking care of the mad, treating the poor, and praying for wealthy patients. However, by putting medical economics at the center of her tale, she forces all of us to see what we thought were familiar developments in a new and sharper light." Bull. Hist. Med.